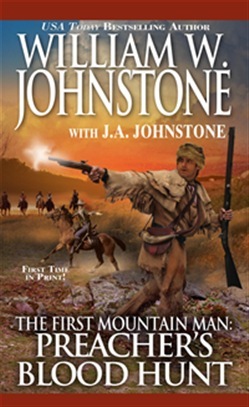 The Greatest Western Writer Of The 21st Century It's fur trapping season and Preacher is about to discover the Rocky Mountain trail holds more than wild game--it's also infested with murderers and trail trash quick to deceive, steal, and hunt Preacher down. Among them are Jebediah Druke, his ruthless band of killers, and most terrifying of all, the barbaric renegade Crow warrior known as Blood Eye. When Preacher shows up and gets on their bad side, he stirs up a clash that could lead to a brutal and bloody battle. Preacher gears up for his own brand of raw justice when he learns Blood Eye's been tracking him with nothing but bad intentions. There's a showdown coming and only one man will ultimately rise up out of the carnage. . .
Acquista Preacher's Blood Hunt in Epub: dopo aver letto l’ebook Preacher's Blood Hunt di J.A. Johnstone, William W. Johnstone ti invitiamo a lasciarci una Recensione qui sotto: sarà utile agli utenti che non abbiano ancora letto questo libro e che vogliano avere delle opinioni altrui. L’opinione su di un libro è molto soggettiva e per questo leggere eventuali recensioni negative non ci dovrà frenare dall’acquisto, anzi dovrà spingerci ad acquistare il libro in fretta per poter dire la nostra ed eventualmente smentire quanto commentato da altri, contribuendo ad arricchire più possibile i commenti e dare sempre più spunti di confronto al pubblico online.